Get one lower limit dumbbell and upper limit dumbbell. Medicine Ball as per your convenient weight. A small dining chair or step stool. There are many different types of back exercises available to strengthen the lower back; however we focus on 4 to 5 types depend on the level of the student. If you experience pain when you perform any of them, limit the particular exercise and do it comfortably. This is just the start and it is always best to increase the intensity and frequency of back exercises once you complete this course. The more we strengthen the back the more the relief is. Always stretch and warm up before you start any exercise. Sit on the floor and extend your legs. Fold the right leg and place the right foot along the outer side of the left knee. Keep your right hand at the back inline with the shoulder to support you and slowly bring your left hand around your right knee and try to touch your left knee. Make a twist on your right by looking at the back. Hold the position for 15 to 30 seconds and slowly return to the normal position. Repeat on the other side. Sit in the floor keeping the back straight. Extend the left leg and fold the right leg to touch the right foot with the left thigh. Keep the left leg flat on the floor without any gap under the knees and point the foot upwards. 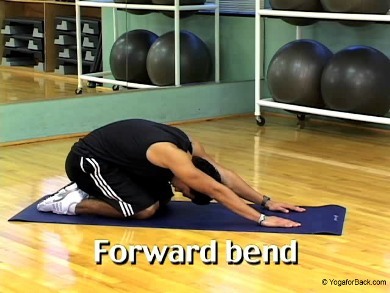 Slowly bend forward and try to reach the left foot with your hands. Do not strain your back, stretch as much as possible and hold for 15 seconds initially and extend to 30 seconds as you progress. You should feel the stretch on your hamstring and calf muscle. Repeat on the other side. Sit on the floor with back straight. Fold your right leg and cross your left leg to the right side as shown in the picture. Now using both the hands; hug your left leg bringing closer to your chest as much as possible. Keep your back straight and feel the stretch on your left gluteus. Hold it for 15 to 25 seconds and repeat on the other side. Place the step stool in front of you. Right leg up, left leg up and right leg down, left leg down. Do for 30 seconds. Now do the alternate leg. Left leg up, right leg up and left leg down, right leg down. Do for 30 seconds. Increase the speed as you progress and increase the time up to 1 minute on each side. This is the first step in back exercise to increase the heart rate. Stand with your back straight, abs tight and knee slightly bent. Bending the knee is very important; otherwise pressure will be on the back. Hold the desired weight of dumbbell in both the hands (in my case 15 lb) and slowly bend forward with knees slightly bent and try to touch the floor. Hold for a moment and feel the stretch in the hamstring. Slowly raise your hands up to knee level and repeat for 12 to 15 times. Lunge forward with first leg. Land on heel then forefoot. Slowly bend your knee of front leg until knee of rear leg is almost in contact with floor. 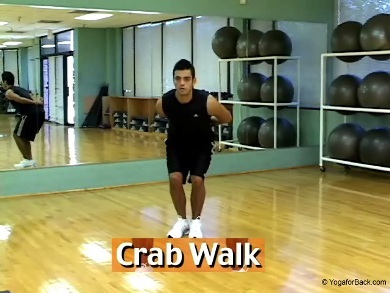 Return to original standing position by forcibly extending the hip. Keep torso upright during lunge; abs tight and chest forward. Lead knee should point same direction as foot throughout lunge. You can add weight with dumbbell. Repeat for 12 to 15 times on each leg. Lunge to one side with first leg. Land on heel then forefoot. Lower body by flexing knee and hip of lead leg, keeping knee pointed the same direction of foot. Return to original standing position by forcibly extending the hip and knee of the lead leg. Keep torso upright during lunge; abs tight and chest forward. Lead knee should point same direction as foot throughout lunge. Repeat for 12 to 15 times on each leg. Lunge backward with first leg. Slowly bend your knee of front leg until knee of rear leg is almost in contact with floor. Return to original standing position by forcibly extending the hip and knee of the backward leg. Keep torso upright during lunge; abs tight and chest forward. You can add weight with dumbbell. Repeat for 12 to 15 times on each leg. Use your gym ball or chair for this exercise. Stand legs shoulder apart and slowly try to sit on the chair without actually sitting. Pause for a second at the bottom before you go back up. Keep torso upright; abs tight and chest forward. Slightly lean forward so that your back is parallel to your legs. Your body weight should be equally distributed to your foot, ankle and knee. You can extend both the hands in front of you for balance. Do 12 to 15 repetitions. 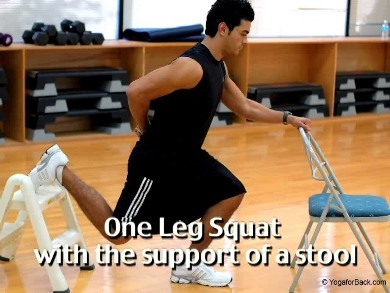 Stand at about 1 to 2 feet in front of a chair or step stool, put one leg back at the back for balance. Squat as you would in a regular squat, sitting back rather that leaning forward. Your weight should fall on the heel of the base leg. Squat till parallel or a bit below parallel, pause and return to starting position. Do 8 to 15 repetitions on each leg. If you notice any pain in the knee and if you continue to have it, discontinue this exercise. Once we strengthen other muscles, we can continue this later. Bend a little forward and walk on your side for about 10 steps and return back to the original place. You can extend your hands in front of the chest for balance and keep the back straight and abs tight. Walk another 10 steps and return back to starting place. Stand with your knees and hands and slowly raise the left hand and right leg, hold it for 3 to 5 breathing (one inhale and exhale is referred as one breathing) and slowly come back to original position. Do not slouch your back, tuck in your stomach and keep the back straight. Now alternate the hand and leg. You should feel the stretch on your lower back. Do 12 to 15 repetitions on each side. Lie down flat on your stomach with both hands stretched forward. Squeeze your buttox and tuck in your stomach, slowly raise the left hand and right leg along with your chest and thighs as much as possible and slowly come back to the original position. Now alternate the leg and hand. You should feel the stretch on your lower back. Do 12 to 15 repetitions on each side. Sit on the floor with your legs folded and foot flat as shown in the figure and slowly bend forward, you will feel relaxed on your back. Hold for 3 breathing and come back to original position. Keep your back straight and repeat this for 5 times. Lie down on your back with your legs folded. Squeeze your buttox and tuck in your stomach, slowly raise your whole body with the support of shoulders and foot. Rise until you feel the back is straight. Hold it for 3 to 5 breathing and slowly return to the original position. 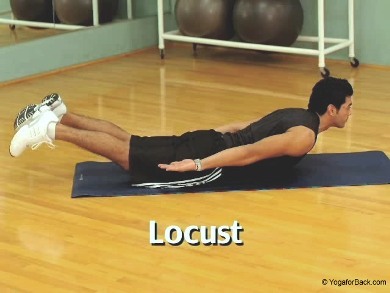 At this position press your lower back to the floor and hold it for 3 to 5 breathing and repeat. You should feel the pressure on your lower back. Repeat for 5 times initially and increase it to 8 to 10 times. Lie down flat on your stomach with both hands on your side with palms facing up. Squeeze your buttox and tuck in your stomach, slowly raise the upper body from the chest and the lower body from the thighs. You will feel the stretch on your lower back. Hold for 2 to 3 breathing and slowly return to the original position. Do 8 to 12 repetitions. © to Yoga for Back 2007 - 2011. All rights reserved.